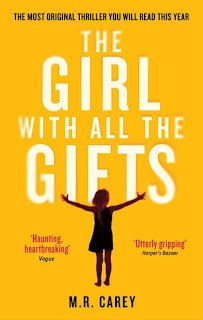 Book 25 of 2015 is The Girl with all the Gifts by M. R. Carey. This was recommended to me by pretty much everyone I know who reads. Although this is a genre I like to watch in movies and on TV, it is not one that I really enjoy reading. It usually depresses me. This isn't the cheeriest book but the pace is perfect and the plot twists enough that I was often surprised. It is hard to talk about this book without ruining it for those who have not read it so I won't. 4 post apocalyptic children out of 5. Should I read this? Yep, without a doubt. What did I learn? When the end of civilisation comes, I'd like to end with it.